With rising energy costs, property managers should consider checking the performance of their buildings. This can be effectively and efficiently done using a thermographic building survey. Thermography is a powerful, non-contact diagnostic tool that enables the heat differences in equipment and facilities to become visible. 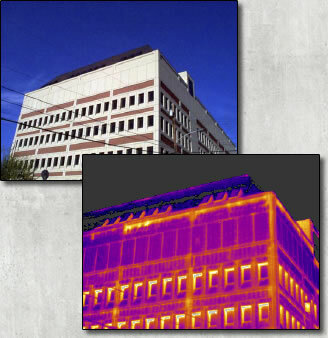 Thermography is highly valuable in detecting problems associated with temperature rise or loss in buildings. Thermography can easily locate these problems when there is approximately a 20°F temperature difference from outside to inside. Identifying faults can protect the investment in equipment and materials housed in the structure. Condensation within wall insulation can lead to deterioration, which is costly to repair. Air leakage can cause water pipes to freeze in colder climates; therefore, a survey can save both time and money by determining the size and scope of these problems. However, the primary benefit to a building inspection is energy savings. The high cost of constantly replacing the energy lost due to these kinds of problems can easily justify a thermographic inspection. The cost of performing one of these infrared building inspections is minimal compared to the cost savings a company will achieve once problem areas are identified and repaired. We at VIS provide our clients with the most powerful infrared imagers available today. With over 33 years of experience as an independent company, VIS is well staffed with trained and certified thermographers to address all your infrared and industrial inspection needs.